NEW YORK CITY – For the last two weeks in January, New York City will become The Destination for collectors, dealers, curators and scholars as the city plays host to antiques shows, auctions, lectures and exhibitions dedicated to antiques, modern art and fine art. What follows are just a few of the highlights of the upcoming auctions, scheduled to coincide with the 64th Winter Antiques Show, the New York Ceramics & Glass Fair, the Outsider Art Fair and the Art, Design and Antiques Show at Wallace Hall. All the catalogs are now viewable online; with more than 2,000 lots scheduled to cross the block in a span of five days, you would be well-advised to start browsing now so as not to miss a thing. Chinese export art is anchored by 100 lots from the venerable London firm of Marchant, which is celebrating its 90th year selling Chinese porcelains and works of art; renowned for its deep research and the quality of its offerings, the selection from this fourth-generation firm presents a widely varied opportunity for buyers. Highlights from various owners include a very rare set of 17 blue and white Tea Cultivation dishes, Qianlong period, circa 1750, in various sizes ($40/60,000). 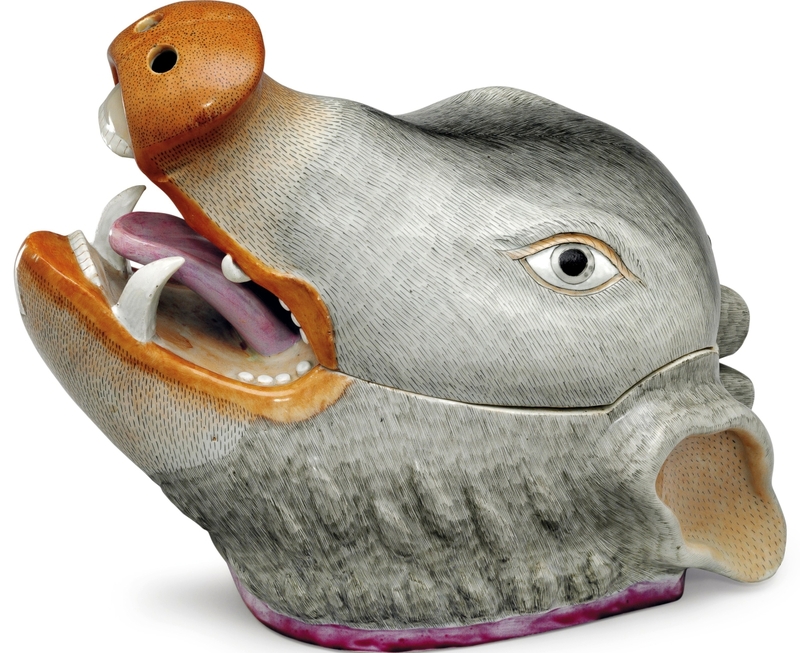 Another interesting lot is a boar’s head soup tureen and cover, Qianlong period, circa 1760 ($30/50,000). Anyone interested in American decorative arts should go to Christie’s on Friday morning, when it will sell American furniture, folk art and Outsider art. First up is “Beyond Imagination: Outside and Vernacular Art Featuring the Collection of Marjorie and Harvey Freed.” Harvey and Marjorie Freed, who were early collectors of Outsider art, bought directly from the artists as well as from top dealers, and were founders of the Intuit museum. 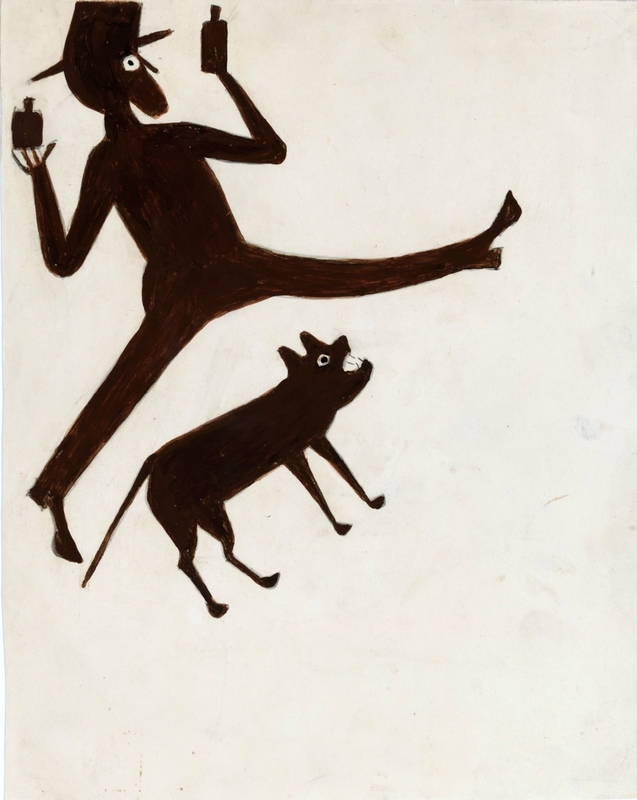 Comprising approximately 50 lots, highlights include a double-sided Henry Darger ($200/400,000), five Bill Traylor works (ranging from $20/40,000 to $40/60,000), a Sister Gertrude Morgan ($15/30,000) and a Martin Ramirez acquired from Phyllis Kind ($15/30,000). The Namits collection is another choice Outsider art collection being sold by Christie’s; strong in both European as well as American Outsider works, it features a significant piece by Adolf Wölfli, made while he was institutionalized at the Waldau Clinic in Bern, Switzerland ($40/80,000), an important Aloïse Corbaz once owned by Surrealist artist Andre Breton ($40/80,000), as well as a 2002 Thornton Dial acquired from the artist ($20/40,000). 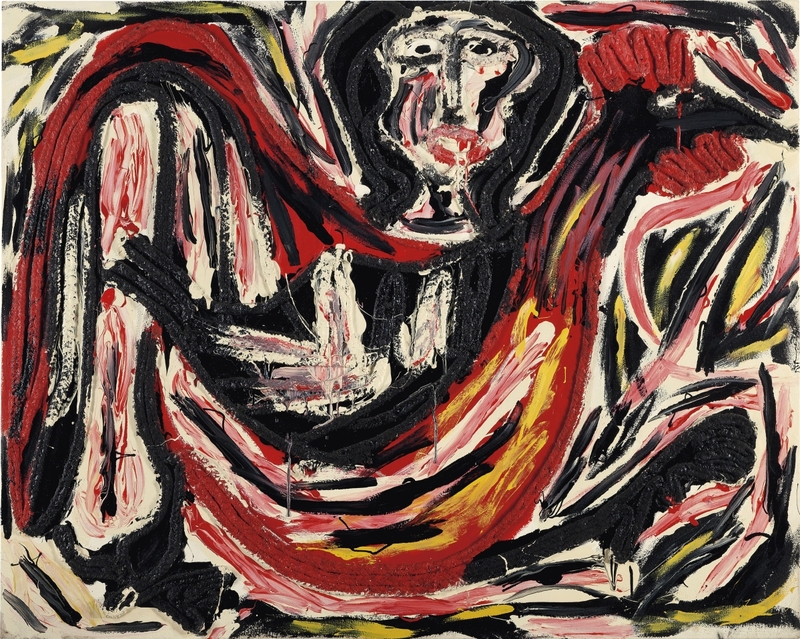 Exceptional works consigned by various owners include a Thornton Dial once owned by the Red Rooster restaurant in Harlem, New York ($20/40,000), and two female sculptures by William Edmondson, the first once owned by Diana Vreeland ($40/80,000), the other unusual in that bears Edmondson’s initials and was included in Nashville, Tenn.’s Cheekwood Museum’s 2014 exhibition, “William Edmondson and Friends: Breaking The Mold” ($50/150,000). Approximately 115 lots of furniture and traditional folk art immediately follows Outsider art. Featured furniture lots include two pairs of Philadelphia side chairs made for Richard Edwards and attributed to Martin Jugiez. According to John Hays, Christie’s deputy chairman, “It’s very exciting, from a discovery point of view. The carving on the knees, which matches that on the Edwards-Harrison family pier table [which Christie’s sold in January 1990 for $4.62 million], is quite beautiful.” The pairs will be sold in consecutive lots, estimated at $30/50,000 and $20/30,000, respectively. 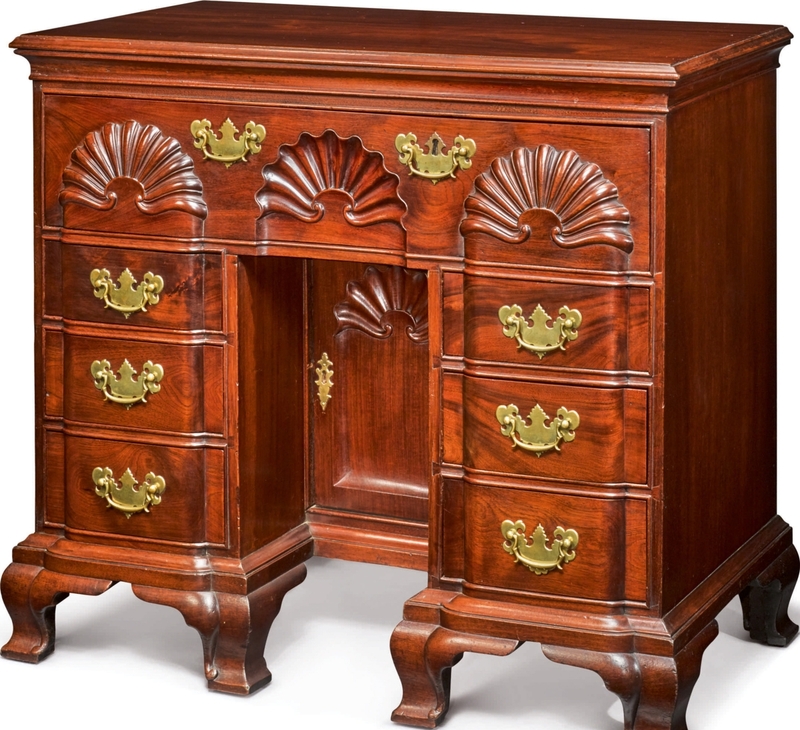 A Queen Anne figured maple dressing table from Philadelphia is one to watch, with an estimate of $250/500,000. 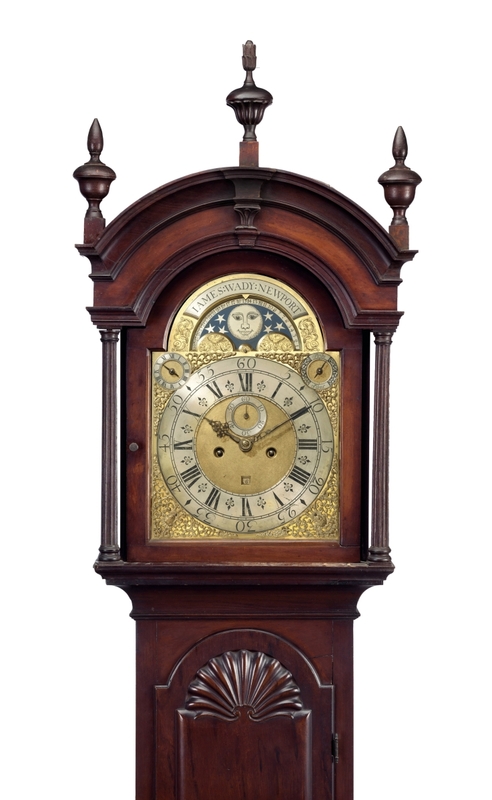 An old friend is the Hunter-Dunn family Newport block and shell carved tall clock with dial engraved by James Wady; when Christie’s offered it in January 2000, the clock had set a record when it sold for $442,500. It will be interesting to see how it performs nearly 20 years later ($200/300,000). 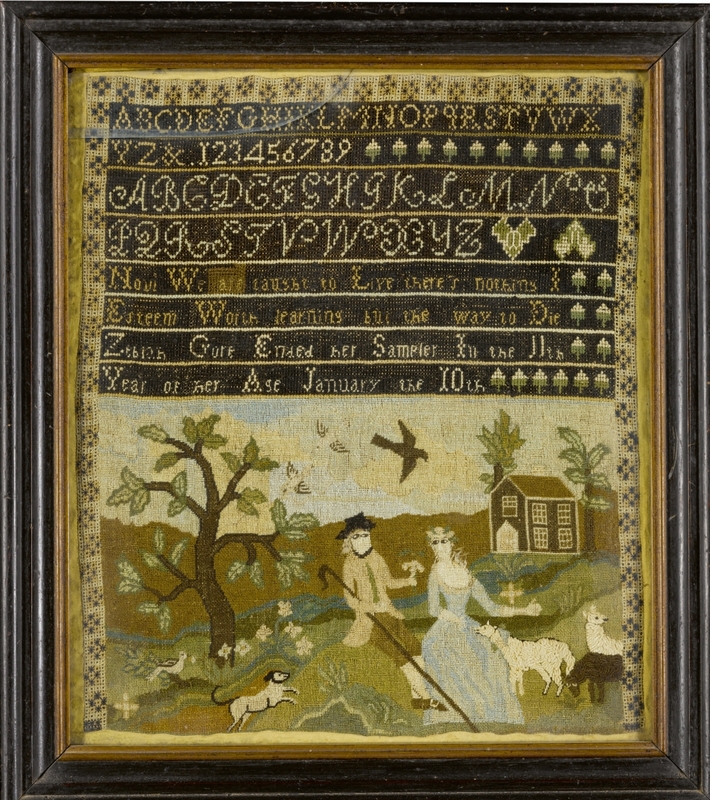 A nicely varied assortment of folk art and paintings include several weathervanes and samplers, including most notably a rare “black background” silk and metal on linen pictorial needlework wrought by Mary Russel, dated 1791 ($60/90,000). 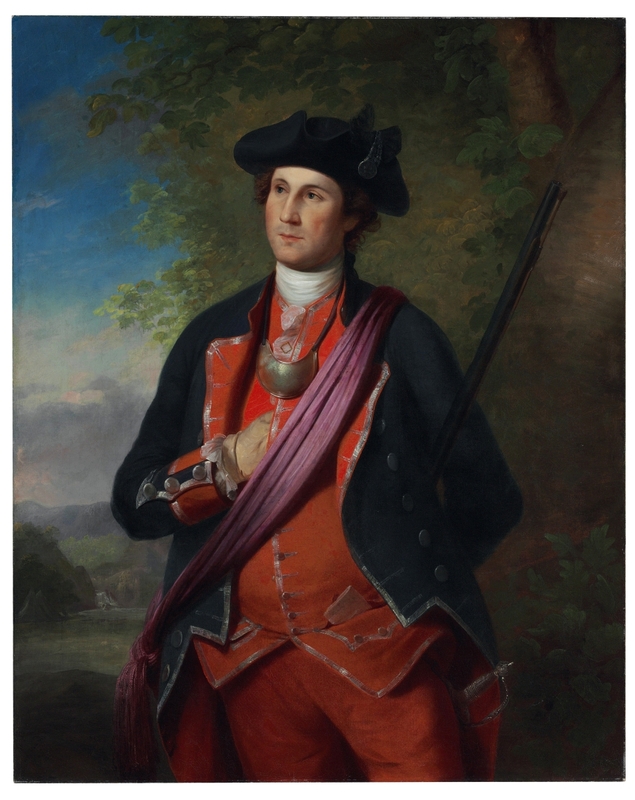 An unusual Thomas V. Brooks cigar store Indian with papoose ($50/100,000) and a stunning portrait of George Washington as a colonial in the Alexandria militia by Rembrandt Peale ($400/600,000) all bear watching. 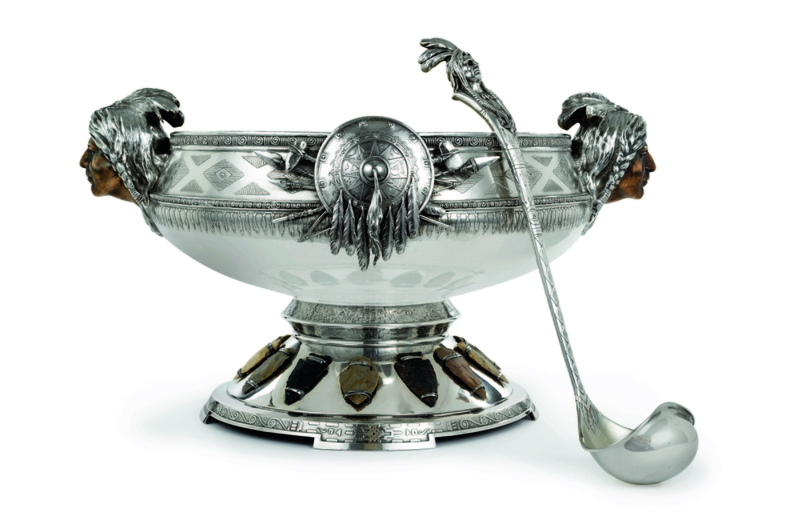 Christie’s offerings of American silver follow the furniture lots, with 57 lots. An interesting and seemingly affordable group are ten lots from the collection of President Dwight and Mamie Eisenhower, acquired before, during and after his presidency, including a set of Steiff Rose pattern flatware service, apparently given to Mrs Eisenhower as a wedding present ($5/7,000). 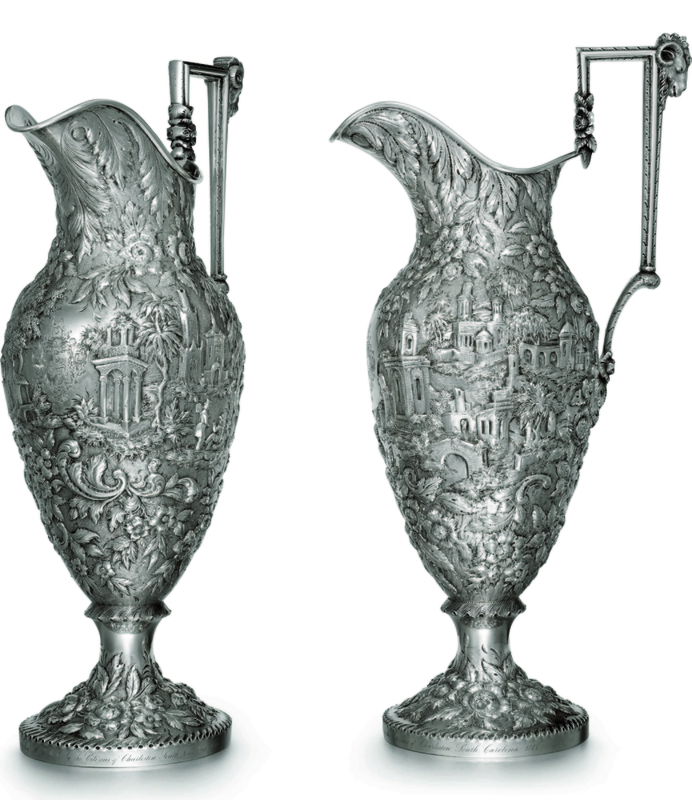 Two notable Tiffany & Co. lots include an unusual silver and mixed-metal three-piece ale drinking set ($50/70,000) and a pair of impressive nine-light candelabrum that were exhibited at the 1893 World’s Columbian Exposition in Chicago ($50/80,000). 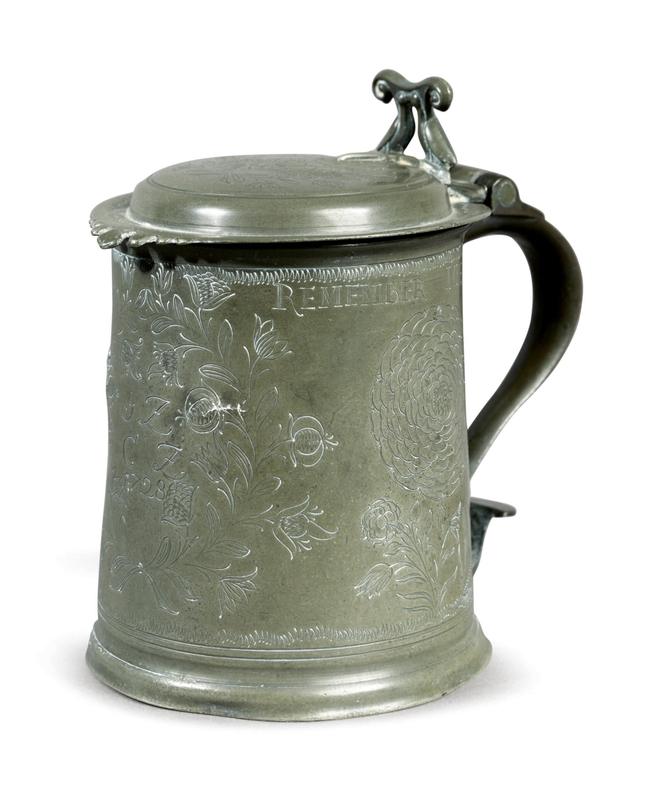 Early American silver is led by a circa 1770 silver coffee pot bearing the mark of Joseph and Nathaniel Richardson, Philadelphia ($30/50,000). 20 Rockefeller Plaza; 212-636-2000 or www.christies.com. With January being the only time of the year when the Sotheby’s offers American decorative arts, the assembled collection of offerings is both broad and deep, with something for everyone in the nearly 1,400 lots being sold over five days. The Americana department is selling no fewer than six single-owner collections in addition to property from various owners. Rather than publishing these collections separately, Sotheby’s has done all of us a favor by creating just two catalogues, with sessions 1-3 in the first volume of the catalog and sessions 4-7 in the second volume. 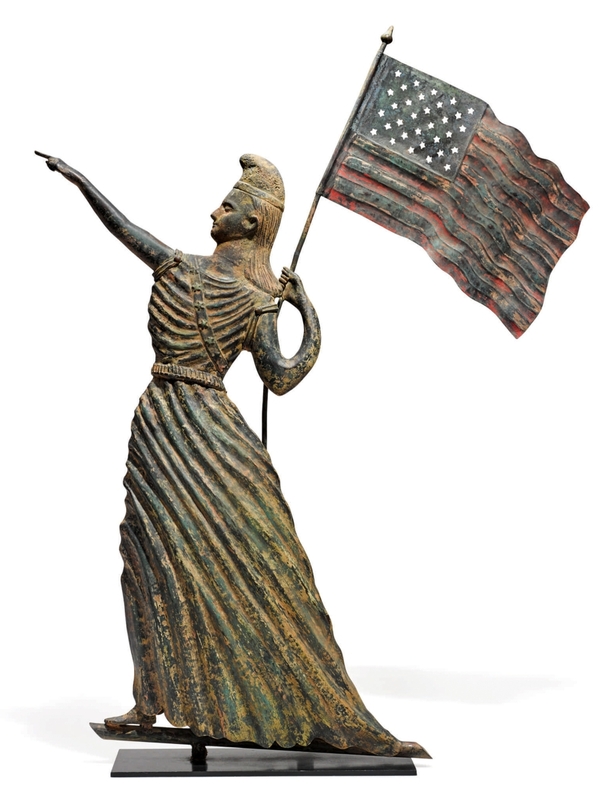 A daylong symposium, titled “Americana Week: We The People,” will be held on Tuesday, January 16, and will include speakers Erik Gronning, Brock Jobe, Gary Sullivan, Stacy Hollander, Jennifer Swope and silversmith Preston Jones. The day concludes with a preview reception for the sales from 6 to 8 pm. 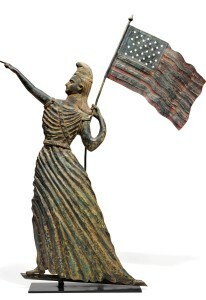 To register for the symposium or reception, www.sothebys.com/americana. Following the success Sotheby’s enjoyed last year when it paired Alexander Hamilton family documents with American furniture and folk art, Sotheby’s has once again assembled an impressive selection of offerings particularly strong in significant color plate books and views, atlases and maps – including an important private collection of maps of the American West. Of significant interest is a very fine copy of The Federalist. A Collection of Essays, Written in Favour of the New Constitution, as Agreed upon by the Federal Convention, September 17, 1787. New York: Printed and Sold by J[ohn] and A[ndrew] M’Lean, 1788. 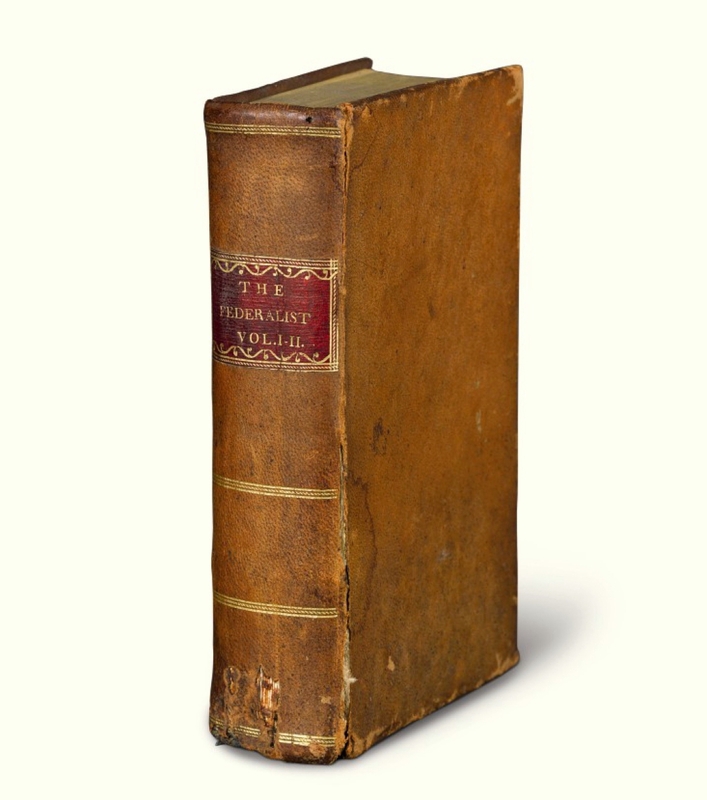 Once owned by the Philadelphia physician and politician George Fox, it is a “classic exposition of the principles of republican government” ($200/300,000). Another important lot is the first seminal map of the American Southwest: “A Map of Mexico, Louisiana and the Missouri Territory” by John Hamilton Robinson, Philadelphia: Printed and Colored by John L. Nartsin, 1819. One of about ten copies known to survive, this is evidently one of three copies deposited by Robinson in the Library of Congress to secure copyright ($200/300,000). The morning session will feature 150 lots of American furniture and folk art, the collection of two New Jersey families, the owner and that of their mentor, Samuel and Esther Schwartz, who was known as a “great collector-scholar.” Assembled with an eye for beauty and quality, the offerings in this group lean heavily toward New Jersey fine and decorative arts. Highlights include early American Judaica, including the earliest known tin menorah ($20/30,000), a pair of portraits of early Jewish Americans by Charles Balthazar Julien Fevret de Saint-Memin ($25/35,000), and the Zabriskie family pewter tankard, dated 1728 ($50/80,000). The afternoon session presents nearly 200 lots, comprising various owners silver, prints and Chinese export porcelain. American silver highlights include a wonderful American silver and copper Indian punch bowl and ladle, attributed to Joseph Heinrich, New York, retailed by Grogan & Co., Pittsburgh, circa 1900-15 ($125/175,000) and a lot with Charleston interest is a pair of American silver presentation ewers, Samuel Kirk, Baltimore, dated 1845 ($20/30,000). 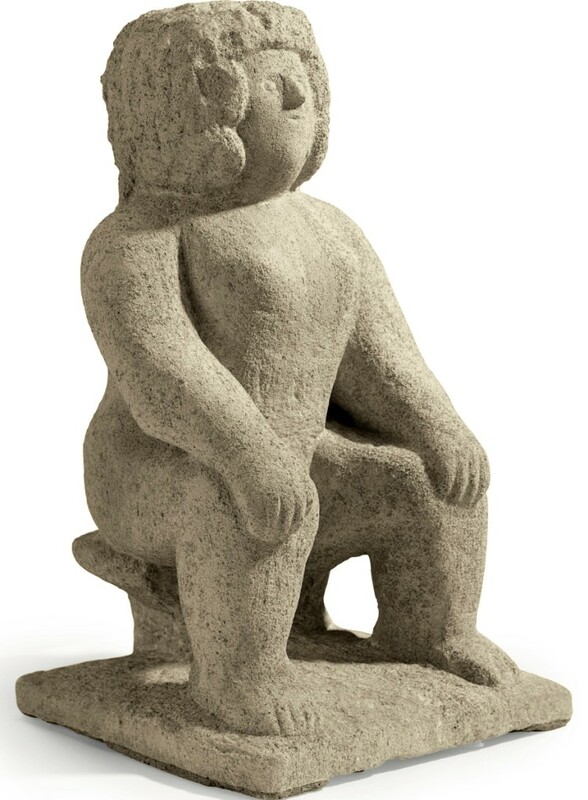 So as not to conflict with competing sales at Christie’s, Sotheby’s won’t resume its sales until the afternoon of Friday, January 19, when it will offer paintings, American and English furniture and decorative arts from the collection of Price and Isabel Glover. The Glover collection is particularly strong in late Seventeenth and early Eighteenth Century English and European ceramics and Eighteenth Century English sporting prints. 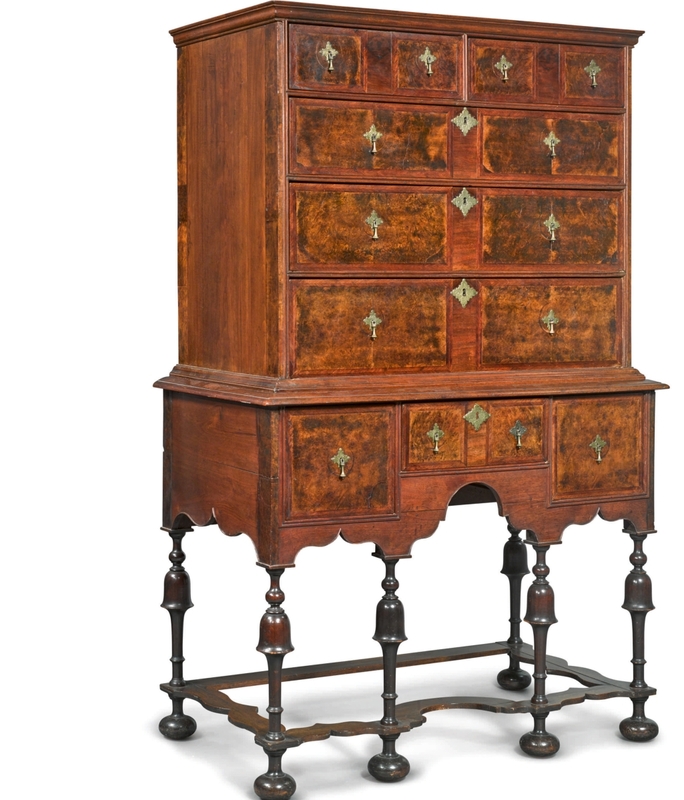 Of particular interest to collectors of Americana will be a wonderful William & Mary Veneered highboy, attributed to Samuel Clement, New York, circa 1720 ($60/120,000). Many lots from this collection will be offered without reserve. Various owners’ American furniture and folk art, as well as the collection of the Dudley and Constance Godfrey Foundation, comprise the morning session. 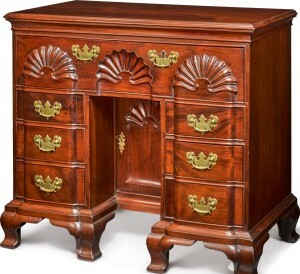 Approximately 100 lots, the Godfrey Foundation’s collection is strong in Sixteenth and early Seventeenth Century American furniture, and includes a rare New York walnut high chest ($40/60,000) and an important set of six Carpenter-Howell-Lloyd-Wistar family Chippendale dining chairs ($20/30,000). 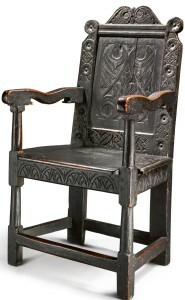 Highlights of various owners’ American furniture and folk art include the rare and important Mansfield-Merriam family Pilgrim Century wainscot armchair, New Haven Colony, circa 1650 ($300/500,000), the Hopkins family block and shell carved kneehole dressing bureau, Providence, R.I., circa 1790 ($300/500,000) and a wonderful fishing lady canvas work picture by Zebiah Gore, Boston, dated 1791 ($80/120,000). The afternoon session starts with nearly 125 lots from the collection of Bobbi and Ralph Terkowitz, mainstay collectors who worked with, among others, the Liverants, Peter Eaton and Joan Brownstein. 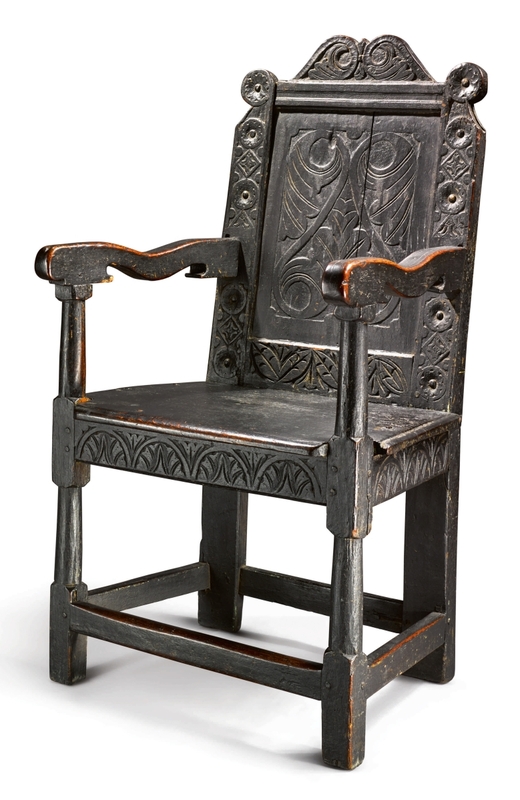 Their collection is particularly rich in folk portraits and high style Federal inlaid furniture from New England and Southeastern Massachusetts. Highlights from this collection include a border-period portrait by Ammi Phillips of “Lena Helen Ten Broeck,” ($200/300,000), a double-portrait of the Davis children by Edward Savage ($100/200,000) and Isaac Heston’s “Portrait of Catherine Clinton Heston” ($140/180,000). 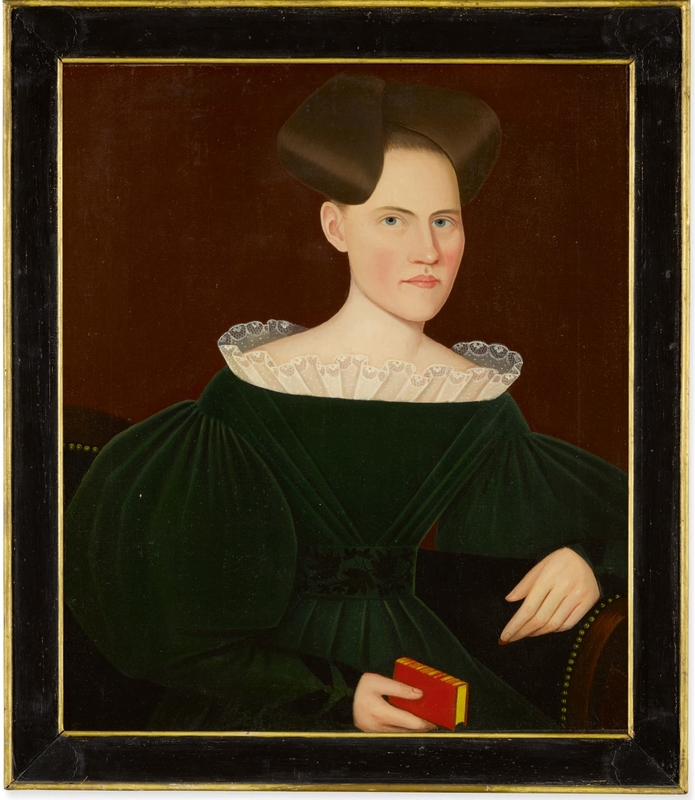 For those still standing, Sotheby’s final day of sales of Americana will begin with more Americana from various owners, including 50 lots of furniture and folk art from the collection of Annie Abram and Steve Novak, highlighted by a pair of portraits of George and Catherine Fake by Ammi Phillips ($80/120,000). 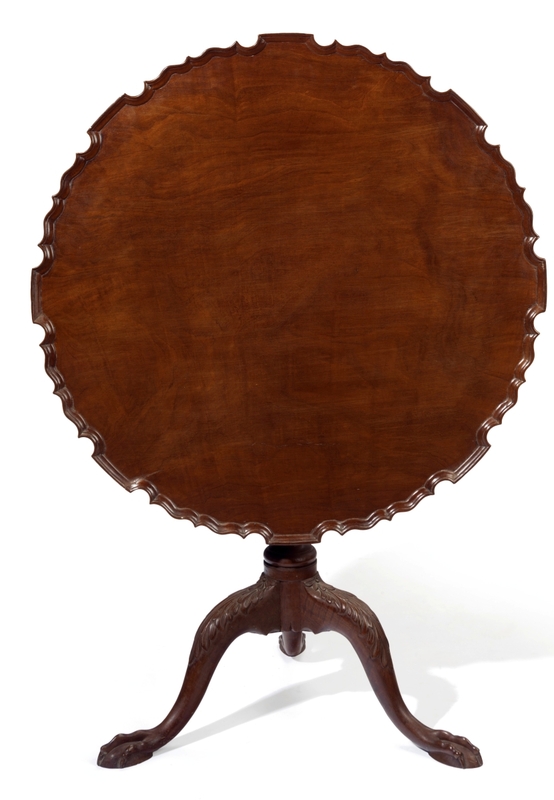 The collection of Patricia Sax, the widow of legendary collector Stanley Sax, will feature approximately 85 lots and predominantly comprises Classical furniture, featuring a figured and ormolu-mounted mahogany bureau bearing the stamp of Charles-Honore Lannuier ($60/120,000) and a pair of Deming and Bulkley games tables ($50/100,000), to name just a few of the important lots. The last session of Americana on Sunday includes the collection of Mark and Susan Laracy, who are selling works acquired since they sold their folk art collection at Sotheby’s in 2007. 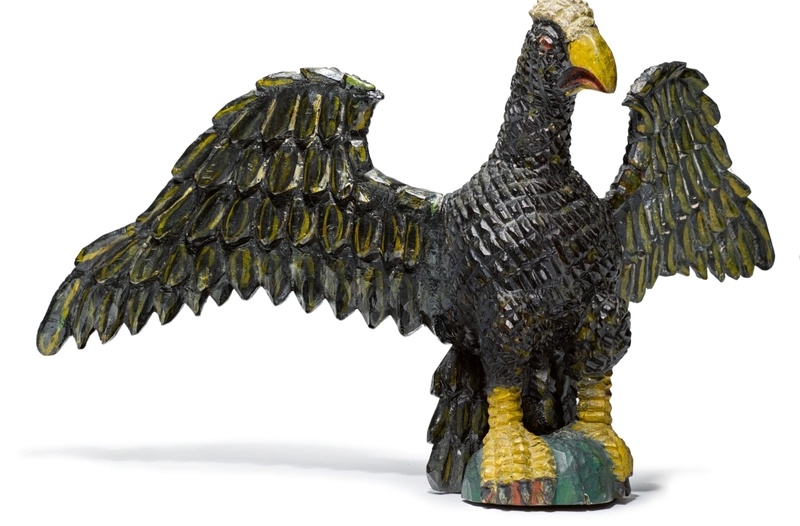 Other property from various owners includes several carousel figures and cigar store figures, including a baseball figure by Samuel Robb ($300/500,000), a Schimmel eagle ($80/120,000) and a Liberty weathervane attributed to J.L. Mott Ironworks ($100/200,000). On January 17, Doyle Galleries will offer the Collection of Noel and Harriette Levine, patrons of the arts and donors to both the Metropolitan Museum of Art and the Museum of Modern Art. A consummate connoisseur, Mrs Levine assembled a collection of English furniture, silver, decorations and jewelry. Highlights include handsome pair of George II walnut armchairs that once formed part of a larger suite at Wimpole Hall, a Seventeenth Century house in Cambridgeshire ($250/350,000). 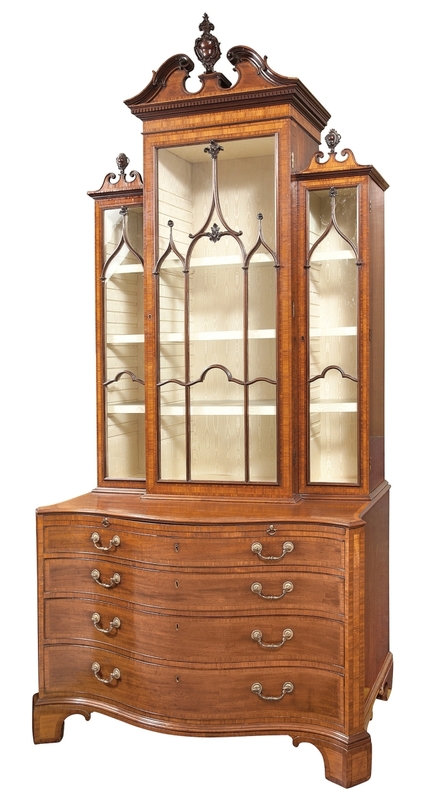 Another not-to-miss lot is an important George III cabinet described as a “China Cabinet” by Thomas Chippendale in The Gentleman and Cabinet-Maker’s Director, which illustrates several examples with similar glazing bars ($100/200,000). Jewelry from Mrs Levine’s collection features dazzling creations by some prestigious makers as Van Cleef & Arpels, David Webb and Cartier. 175 East 87th Street; 212-427-2730 or www.doyle.com.